We saw the potential for innovation during the flood events last winter when we released some of our flood data free of charge. Developers came up with a range of solutions to help – from a phone service that connects people with their energy supplier in the event of a power cut to an app that alerts Twitter users to volunteering opportunities in their local area. We hope that removing cost barriers to our data through Open Data will create more opportunities for developers to create web and mobile applications for businesses and the public to help local communities understand their local environment and better protect themselves from flood risk. As part of our commitment to make our information easily accessible and available, free of charge and with minimal restriction, I am pleased to say that our Risk of Flooding from Rivers and Sea datasets became Open Data on the 11th December 2014. Making these datasets Open will allow users access free of charge, even for commercial use; enabling local communities to use our data to better protect themselves from the risk of flooding. We are releasing three datasets under Open Government Licence and you can access them through data.gov.uk. A map showing the likelihood of flooding from rivers and the sea in England, considering the location, height and condition of 175,000 defences. Results show the annual chance of flooding - Very Low, Low, Medium and High. A database that uses the Risk of Flooding from Rivers and Sea product with Ordnance Survey data to assign one of the flood likelihood categories to properties simply based on the likelihood of flooding to the area the property is within. A database that uses the Risk of Flooding from Rivers and Sea product with Ordnance Survey data and Royal Mail data to show the number of properties in each postcode area that is in each of the four flood risk categories. This is part of a bigger commitment for us and we continue working towards making the most of our information by prioritising which of our data to make freely available next. The second meeting of our Data Advisory Group, chaired by Tom Smith, is on 16th December and I look forward to hearing the group’s view on which of our datasets would be most beneficial to be made openly available. This is an exciting opportunity for our customers to have a real influence on the data we publish. I would encourage everyone, whether on the group or not, to keep up to date with the progress and we would value all comments and suggestions via our website, twitter feed @dataenvagency and @MirandaK_EA, or through opendata@environment-agency.gov.uk. Where can I find out more about the applications developers came up with? We do not have specific information about these apps as it is open data this can be used by anyone without informing us of its purpose. We are currently looking into using media outlets like Twitter for people to share what they use our data for but again we will only find out further information if anyone responds. Would I also be correct in thinking that the attribution statement should be (c) 2014 and not 2013 as stated on http://data.gov.uk/dataset/risk-of-flooding-from-rivers-and-sea, or is this data already a year old? The attribution statement dates have now been updated following your feedback. 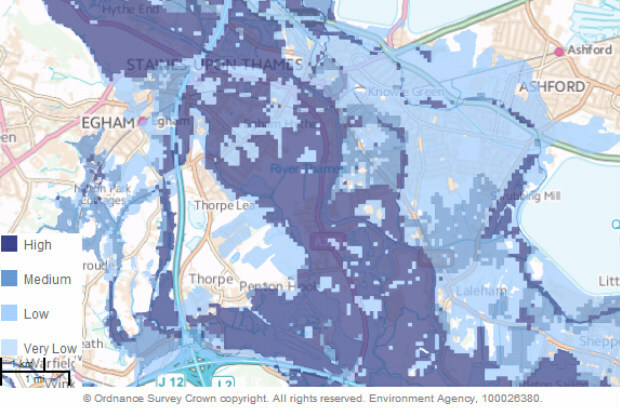 Will the surface water flood risk map data be available soon? Thank you for your enquiry regarding the surface flooding data. Please use the link to data share on this page. There is also information on GOV.UK please use this link to whats in your back yard http://watermaps.environment-agency.gov.uk/wiyby/wiyby.aspx?&topic=ufmfsw. If this still not what you are looking for please email into enquiries@environment-agency.gov.uk with details of an area you are looking at. We will be happy to help you. Are there any restrictions on using that data commercially? Hi, Making these datasets Open will allow users access free of charge, even for commercial use. ii) Costs associated with recorded flood events? When trying to get home insurance I have been declined as my actual house has been listed as flooded in 2013 & 1958 by the Environment Agency.I have been living in the house since 1998 and it has not been flooded, although the surrounding areas have. How can I get this lifted as it's incorrect about my property? Whether an area falls within or outside the area at risk of flooding from rivers, the sea and surface water. Whether there are any defences in the area and the standard of protection that they provide. How likely flooding is, taking into account any risk management measure such as flood defence barriers in the area. Whether there are any future plans for flood risk management measures in the area.